The Shimano Saint bottom bracket is purpose built for gravity and downhill riding (threaded 68/73mm or 83mm option available). This Shimano Saint Bottom Bracket uses the Hollowtech II spindle interface, making it compatible with other frames that use threaded bottom brackets shells that are intending to use Shimano cranksets. In fact, the only difference between the two versions is the length of the plastic inner sleeve between the two bottom bracket cups. The threads on the drive-side of both 68/73mm and 83mm options are a bit longer than your standard Hollowtech II bottom bracket to accommodate BB-mounted chainguide systems. Not only will this help for downhill and gravity bikes, but could also benefit cyclocross racers running a 1x drivetrain and chain guide system. I was looking for a replacement bottom bracket, and decided to pick this up considering the price. Great part, quick shipping and amazing price. Didn't last as long as other BBs I've had, but good deal for the price. Plus, it's gold. Bling! Great bottom bracket upgrade and killer price. I love the smooth rolling quiet feel of a new bottom bracket. as always, a bang for the buck item, fast delivery. delivered as promised. always on time. I choose this as it provided a bit more width to add in a chain guide for my 1x10 drive train, while allowing my chain line to remain correct. The best quality and very resistant. Looks great in gold. Arrived quickly and exactly as advertised. Installed easily on my 2017 Rockhopper pro which uses the stock Specialized Stout XC crank. It definitely adds not only a performance/longevity benefit but a bit of improvement in the looks department as well! your review here. It must be at least 50 characters long. Consider whether you would recommend this product and what you like or dislike about it. I love this new BB. It's smooth and seems to be more solid than the bontrager one I pulled out. For a few extra bucks I figured I'd try the Saint BB instead of XT. I like the smooth bearing action and solid feel through the Crankset. I'd recommend this to anyone. Super smooth, great bottom bracket. Highly recommend. Way better than my race face. I like the extra space this bb offers for a bb chain guide, and the color is nice. For the price, it's hard to beat. Bought to do a re-fresh of my daughter's bike. Wanted a new BB, as the one that came with the bike was a bit worn and fiddly. This works great for any HTII cranks. Spins well, easy to install, looks great, and is inexpensive. excellent product, the relationship quality price is very good. Seriously, for the price of these Shimano bottom brackets, it's a wonder everyone doesn't have one or two in their parts box all the time. After a month of muddy weekends at the bike park, your BB will probably feel like it has a sandbox inside, regardless of how "high end" it is. Rather than fussing around with re-greasing or pushing out bearings, just pop in a new Saint BB and go ride! It's cheap, it works great, and it's gold...can you really ask for more? Don't waste money on anything else. Shimano BB are always good. If you need extra thread for B.B. mount chain guide or just need to space out for boost rear on a standard BB shell, the Saint is good because you get the extra thread on the drive side to accommodate those things. Best BB for the price available!!! Hreat bb. Looks good too. Only downside is it doesn't have replaceable bearing like a rotor or hope, but it's signoficantly cheaper. Would recommend. Easy install, good price, light weight. Works perfectly without any issues. I'm using the Shimano Saint Bottom Bracket (83mm) with Shimano's ZEE crankset. They work perfectly. The ZEE crankset does come with its own bottom bracket set. But I upgraded for Saints durability and the gold "bing" factor. Can I replace my shimano SM BB51 with this one? I'm looking to replace the Race Face DH X-Type BB on my 2012 Diamondback Mission with a Race Face Respond Crank. Will this Saint Bottom bracket work? Will this work on my diamonback Mason 1? It has a sealed cartrige bottom bracket atm, and is this compatible with the Racefacr Cinch 1x aeffect? Will this fit a road bike? BEST ANSWER: Maybe. Since road cranks use shorter spindles, you would most certainly have to delete the plastic sleeve when you assemble it. You would most likely have to delete all of the spacers as well. Then you are left with the potential problem of the mountain cups being slightly wider than the cups on a dedicated road bb. If you are using a mountain crank, no problem. If you are using a road crank, well, you may want to search google for more info on this. It is definitely a tough bottom bracket, so if you can make it work, it should last a long time. It’s a specific size/thread - it will fit only if same sizes in frame. Different bike’s take different bb’s - need to check if threaded or pressfit - than confirm thread size of frame. Bottom line - maybe. Measure you BB. This will fit any bike as long as the measurements jive. are compatible with shimano zee crank? BEST ANSWER: Yes, they are! I'm running the Saint Bb with shimano Zee cranks too. Just make sure you order the proper BB size. (It's just a plastic spacer) There's 83mm or 73- mm. Hope this info helps. It should fit, I used it with an XT crank. The shell width is adjustable and all the shimano run the same diameter. Will this fit the 2010 specialized epic expert 26''? BEST ANSWER: Yes this should fit. I think the carbon frame of that year was press-in, but the alloy frames with the regular Shimano crankset will accept this BB no problem. No. I think you will need a BB91 press fit. These are threaded. Could I used this bottom bracket for 2017 diamondback haanjo ? BEST ANSWER: This is for shimano hollow tech 2 cranks sets. You will need to check if your cranks are compatible with this B.B. Assuming the thread pattern is a match. 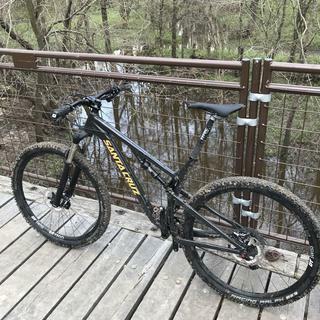 Hi I have a 2009 specialized sx trail. It has a 73mm bb with English thread GXP. Will it work? BEST ANSWER: DJ, if your frame has a 73mm english thread BB, choose the "Gold, M810/820 67/73mm" option from the drop down menu when ordering. However, this bottom bracket will only be compatible with Shimano Hollowtech II and Race Face X-Type style cranks. You mentioned GXP in your question. If you currently have a SRAM GXP crankset, you will need to replace your bottom bracket with a SRAM GXP compatible bottom bracket. Will this work for a Boost XT crank? Could I use the race face aeffect cinch (24mm spindle) with this BB? and will the Parktool BBT-79 work with this BB? When I measured my bb on the bike it measured 3.75 inch or 95.25mm what size bb do I need 83mm or 100mm?